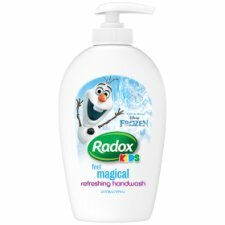 Radox Kids Frozen Handwash is perfect for keeping those little hands clean and protected every day. This antibacterial liquid handwash and liquid soap with thyme and tea tree washes away dirt and bacteria. Frozen variant also available in Body Wash and Shampoo & Conditioner. Caution: If you get some hand soap in your eyes, just rinse well with clean water. Hand soap suitable for daily use, for external use only. For best results pump out our moisturising hand soap and hand wash, lather on hands and rinse off liquid soap with warm water. At Radox we know that parents are looking for a hand wash that encourages fun but is still caring to their child’s skin. Radox has been taking inspiration from natures ingredients since 1908 and now offers parents the perfect mix of fun and expertise by combining Disney’s most popular characters with our Radox antibac handwash specially developed for young kids. It’s not always easy to get children to enjoy washing their hands, but Radox Frozen antibacterial handwash makes handwashing fun keeps hands bacteria free and protected. Your little one will have loads of fun getting clean with this Disney Frozen themed liquid hand wash and moisturising hand soap. So, while your little one is having fun getting clean, you can relax in the knowledge that their tender skin is being cared for and protected.